Grasslands (also called Greenswards) are areas where the vegetation is dominated by grasses and other herbaceous (non-woody) plants. v Grasslands (also called Greenswards) are areas where the vegetation is dominated by grasses and other herbaceous (non-woody) plants. v Grasslands occupy about 24% of the earth’s surface. v The highest abundance & greatest diversity of large mammals are found in these ecosystems. v The antelope & other large herbivores of Africa. 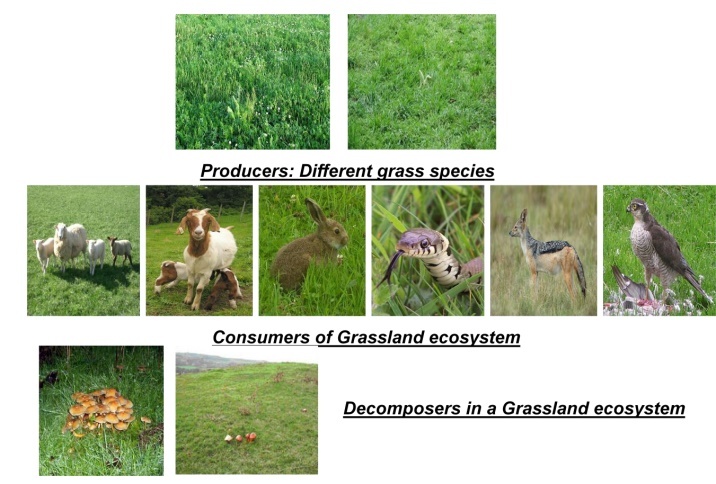 v In grassland, producers are mainly grasses; though, a few herbs & shrubs also contribute to primary production of biomass. v Brachiaria sp., Cynodon sp., Desmodium sp., Digitaria sp. v Cows, Buffaloes, Sheep, Goats, Deer, Rabbits etc. v Besides them, numerous species of insects, termites, etc are also present. v These include;-Frogs, Snakes, Lizards, Birds, Foxes, Jackals etc. v These include hawks etc. which feed on secondary consumers. v Therefore, nutrients are released for reuse by producers. v These include basic inorganic & organic compounds present in the soil & aerial environment. v The essential elements like C, H, N, O, P, S etc. are supplied by water, nitrogen, nitrates, sulphates, phosphates present in soil & atmosphere.